Chinese weddings often involve tea ceremonies, where the bride and groom honor their grandparents, parents, aunts, uncles and other senior relatives in their respective families. It is a simple but lovely tradition, where the bride and groom serve their relatives tea, and the relatives in return give the couple an envelope, which is usually their wedding gift. I love cultures that honor their relatives, so photographing Chinese weddings is always a joy for me. This particular Chinese wedding included 600 guests, so the bride chose the Universal Hilton for her ceremony and reception. The tea ceremonies took place earlier in the day, at the bride and groom's respective homes. 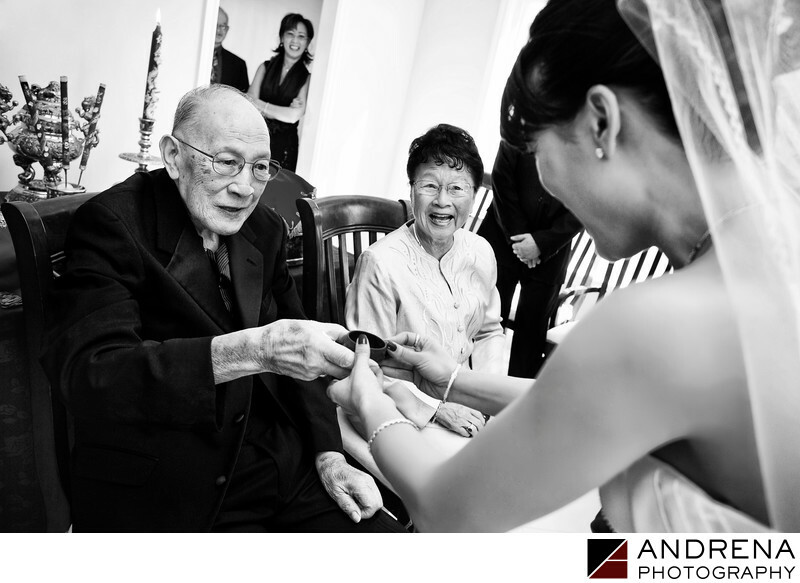 I love this photo of the bride's grandparents handing her their wedding gift. Even though you can't see the bride's face, you can see that she is smiling from ear to ear. Chinese wedding photographed at the Universal Hilton.